For many, chipped, cracked, broken, decayed, and missing teeth are just a normal part of everyday life, which includes the oral health and appearance problems that go with them. If this sounds like you, then the solutions you need can be found right here at Petty Dental. Dr. John Petty will take the time to sit down with you so he can fully understand your issue, and then he’ll offer you a variety of restorative options to fix it. If you’re ready to enjoy a complete smile again, contact us today. When it comes to repairing damaged, decayed, or weakened teeth, nothing beats a dental crown. This custom-made tooth-shaped restoration can bring back a tooth’s original strength and appearance in just two easy visits to our office. And, crowns can even be attached to additional prosthetic teeth to literally bridge the gap left by missing ones. Regardless of what you need, we can provide a restoration that seamlessly blends into your smile and allows you to grin with complete confidence. 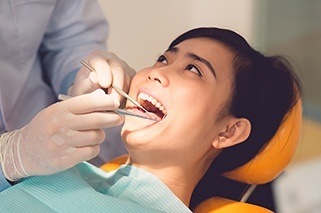 Tooth-colored fillings allow us to do something that is simply impossible with traditional amalgam ones, and that’s restore small cavities without altering the appearance of a tooth. 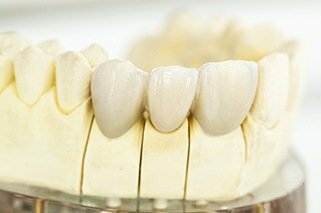 See, tooth-colored fillings are actually made of a plastic-based material called composite resin, and as you can probably guess, it can be specially shaded to perfectly blend in with a patient’s tooth color. This makes the fillings practically invisible in the mouth. They also offer a more conservative solution compared to regular fillings, as less material is needed to fully repair a tooth. This leaves your tooth’s natural strength and structure largely intact, which means it won’t only look good, but it will stand the test of time as well. Plus, because they are completely metal-free, these fillings won’t make the teeth more sensitive to hot and/or cold temperatures. They are especially ideal for patients who suffer from various metal allergies. 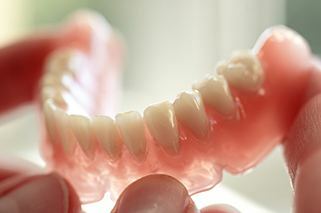 Literally for hundreds of years, dentures have offered a solution for significant tooth loss. Thanks to recent advancements in dental prosthetics, modern-day dentures are now smaller, sleeker, and more natural-looking than ever. Suffice to say, they are much different than anything your parents/grandparents might have had! Each denture Petty Dental creates is custom-made to fit a patient’s particular mouth. A partial denture can replace numerous missing teeth while fitting in with the remaining ones (like the piece of a puzzle), while full dentures can quickly restore an entire arch of missing teeth. They are typically held in place using either small metal clasps or natural suction, but in any case, our team will design a denture that’s perfect for you. No matter what you need, we’ll make sure you walk out of our office with a set of teeth that makes speaking, eating, and smiling as easy as ever.